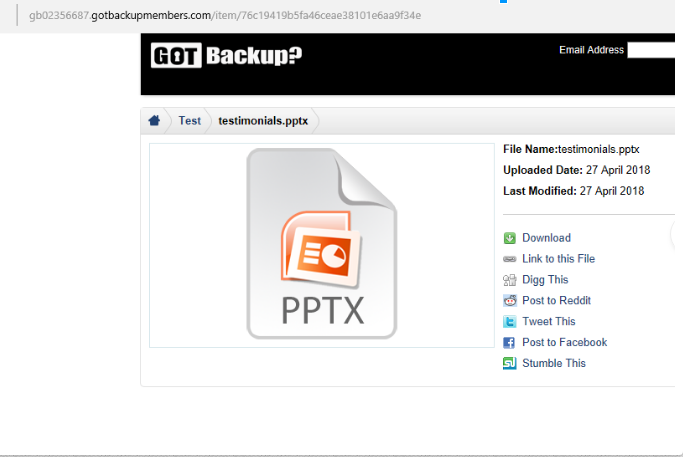 GotBackup Personal - 8.99$ monthly or $95.88 yearly. GotBackup Family - 14.99$ monthly or $155.88/yearly. Where do I find my affiliate urls to market and promote GotBackup? All product resellers have their personal affiliate links. Please log into your account and follow the section «Promotional Tools GotBackup» ---> «Your Affiliate URL’s». How do I set up GotBackup Family? With GotBackup Family package you can create up to 5 accounts. One is auto created with your registered email when you access "GotBackup Login to Members area" button for the first time. The other 4 you can create from your members area "My Account Manager" >> "Got Backup Accounts". Once the account is created, it cannot be deleted or edited. How do I change my email for Gotbackup software? The email you choose for your GB portal is your login and cannot be changed manually. You can set it once from your members area >> "My Account Manager" >> "Got Backup Accounts". Once the email/login is chosen, it cannot be deleted or edited. You can only reset your password. How can I reset a password for Gotbackup software? Please log into your account, click on a blue Gotbackup icon to pass to your GB portal. In the right high corner click on → logout → Forgotten password? → fill in the email associated with your GB software. In a few seconds you will receive the message with further instructions. Follow the link from the message to reset a new password. Backup and Share - Instruction in pictures. 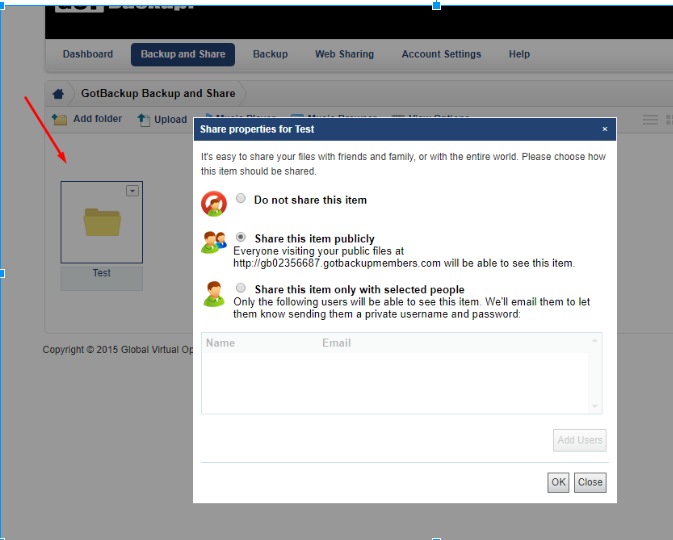 Go to your user portal, select the function Backup and Share. 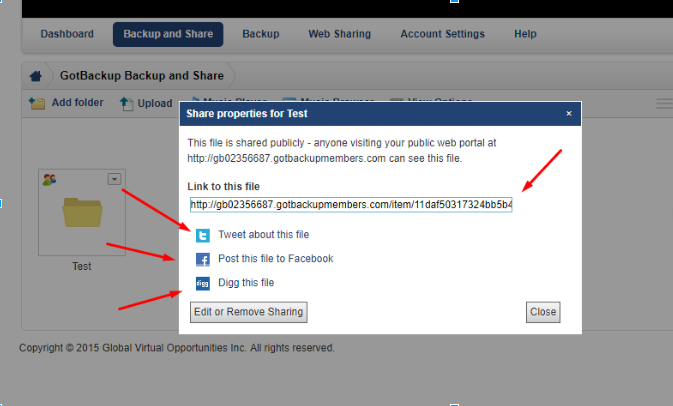 Follow your Gotbackup Member’s portal, navigate on Backup and Share section. You can add the first folder in the "Add folder" section. To upload files from your device, click on "Upload" button. 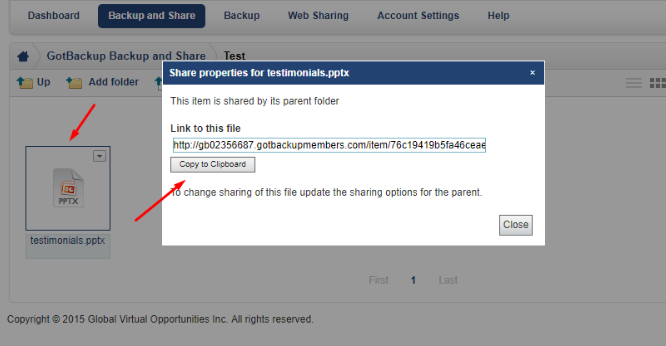 To create public access by reference to a file or folder, select "Share" from the drop-down menu of the file or folder. Copy the link in the dialog box to send it. There is an opportunity to share a file / folder via Twitter, Facebook, Digg. Do I need GotBackup Reseller if I am already Pure Leverage Reseller to earn commissions? No, you are qualified to earn commissions and only required to pay 1 Reseller fee of $19.97/mth. Does Gotbackup works on Windows XP? Gotbackup software only supports the latest versions of XP. What Ports does the Gotbackup software use? Can I have the system work at a slower bandwidth pace so that it does not impact my other internet use while backing up? Click on the GotBackup Icon at system tray >> Settings >> Bandwidth (Tab) >> here you can define limited or unlimited bandwidth. 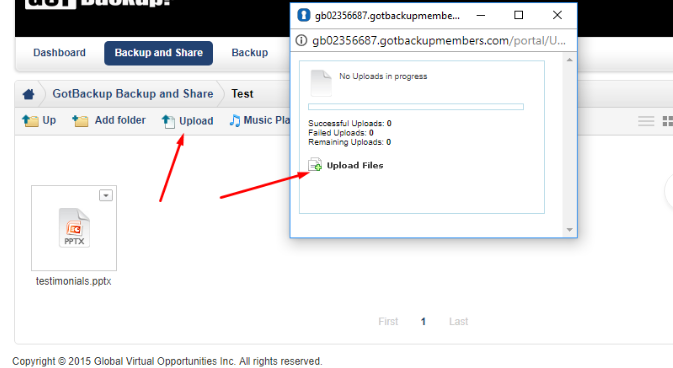 Click on the GotBackup Icon at system tray >> Manage Backups >> Settings (Tab)>> here you can schedule backup or set it to real time.